Healthy Pasta Dishes | Middle-Aged Woman (newly) On The Run! In bottom of lightly heated 3 quart sauce pan drizzle approximately 2 TBSP olive oil and add 1 TBSP butter, heat , over medium heat until butter has melted. Add garlic, basil, thyme, salt, and pepper and stir. Add sliced mushrooms, place lid on sauce pan and cook until mushrooms are soft. Pour in two cans of crushed tomatoes, place lid and bring to a slow boil; reduce heat and simmer. 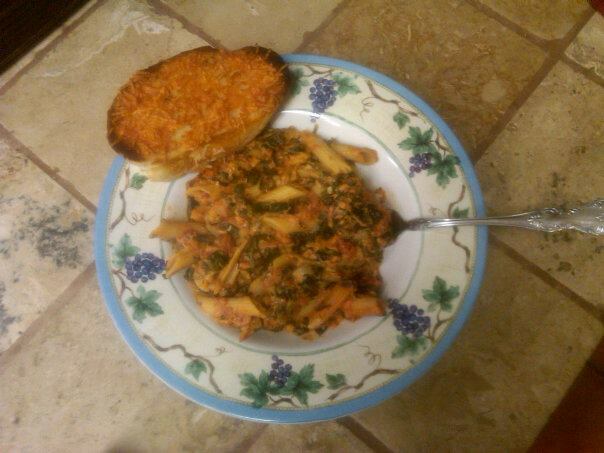 Cook pasta according to package directions, rinse, mix in spinach, sour cream, yogurt, sauce, and cheeses. This is, as a carb laden dish goes, fairly healthy. I call the sauce I made today ‘Cheater’ Pasta Sauce because normally I saute finely minced eggplant, zucchini, onions, bell pepper, mushrooms, and chopped fresh spinach in with garlic and fresh herbs; add blanched, peeled, pureed Roma Tomatoes; then cook all that overnight in the slow cooker. I call it “Julianne’s I-Ate-What? !” Pasta Sauce”. My grown sons know good and well there is: A) zero meat; and B) vegetables they would otherwise never eat; but they eat it and come back for seconds and thirds!